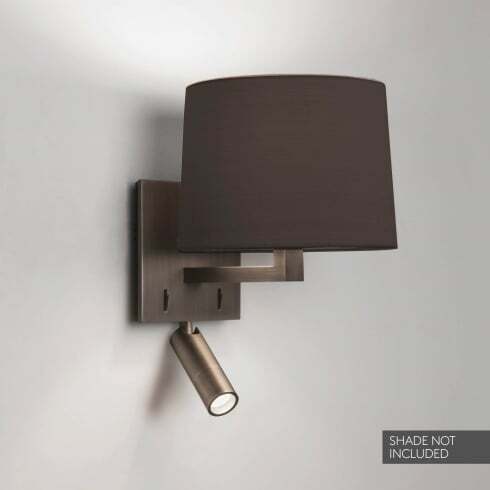 Astro Lighting Azumi LED Reader 2 light wall fitting features a square back plate with an angular arm that points upwards, in bronze finish, to hold a shade of your choice and an adjustable task light which is situated at the bottom of the back plate allowing for focused light where required. The product code for this Astro Lighting wall fitting is 1142048. Combing simple and elegant artistry with modern day practicality, this fixture will make a fantastic addition to classic and contemporary homes alike. The Azumi LED Reader range is available in polished chrome or matt nickel finish which can be ordered on our website.